Well today was the next day of what is gonna be one of the busiest weeks I have known of late. I had a family wedding on Saturday and a big Father’s Day get together for my GrandFather, who happened to turn 90 on Sunday, so a double celebration for him with both his daughters and the extended family in attendance. 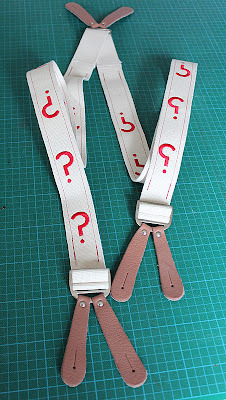 But today marked the first of the Who-happenings I am doing this week – watch out in the blogs for the rest as I write them up . . . The Bomhams Entertainment Memorabilia auction was today, and I went along to view and see how the seventeen Doctor Who items faired. 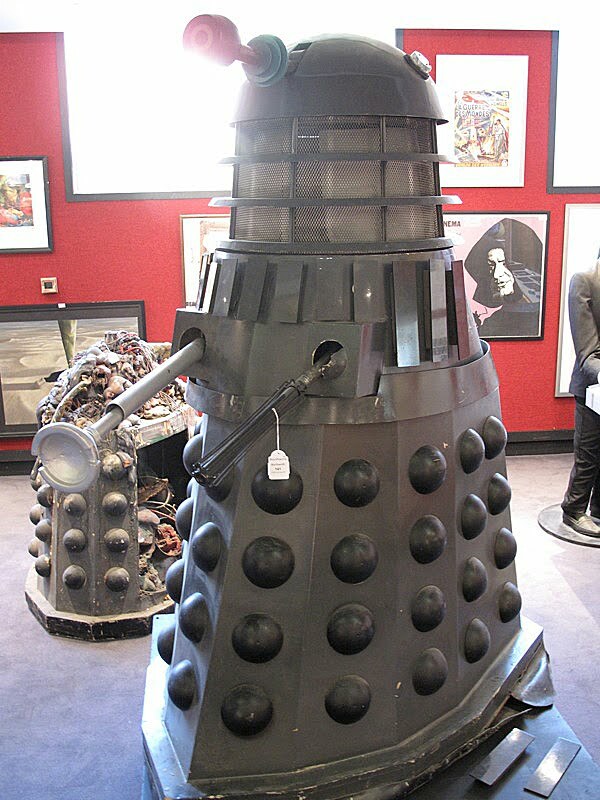 First up, Lot 126, was an original Dalek. Thought to have been actually built for the Amicus feature film, Doctor Who And The Daleks, in 1964, it was sold to the BBC and extensively reworked and modified. 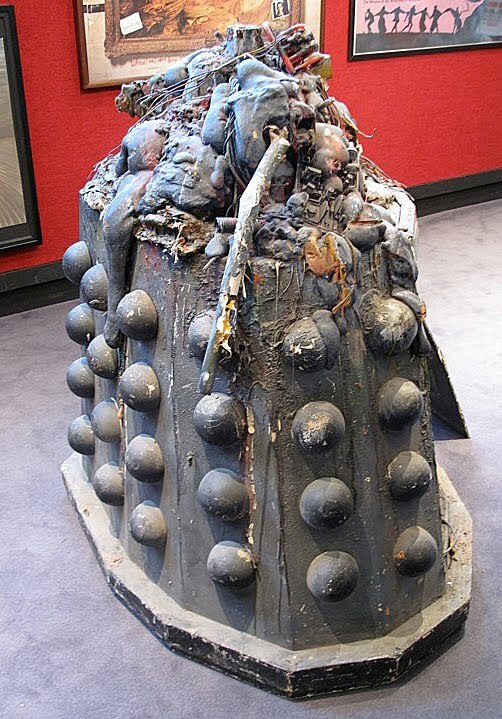 It is officially recognized as the oldest surviving original Dalek, though the back has been removed so it is possible to step inside and see what it is like to be a Dalek operator. It quickly went beyond the £2,00 to £3,00 estimate, selling in the end for £4,800. The next lot, 127, was a lovely little item, and the only one I would have seriously liked to have owned, though I hadn’t registered for bidding. 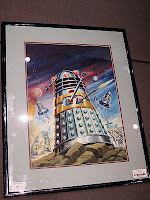 It was the original hand-painted artwork to a 1960s Dalek annual, which I have a copy of at home! This had a very affordable estimate of £500 to £700, but once the commission bids were taken into account, it was soon above this and in the room soared to an amazing £3,600! The tone seemed to be set for these items! Next was another full-sized Dalek, this time one from Patrick Troughton’s era, and one that had been specially adapted to go through narrow doorways! This was evident when you looked at it face on. You can see the skirt is no wider than the shoulders, but it is the correct height and nose-to-tail length. It was also in a very bad state of decay. This sold for £4,800, over its £2,000 to £3,000 estimate. 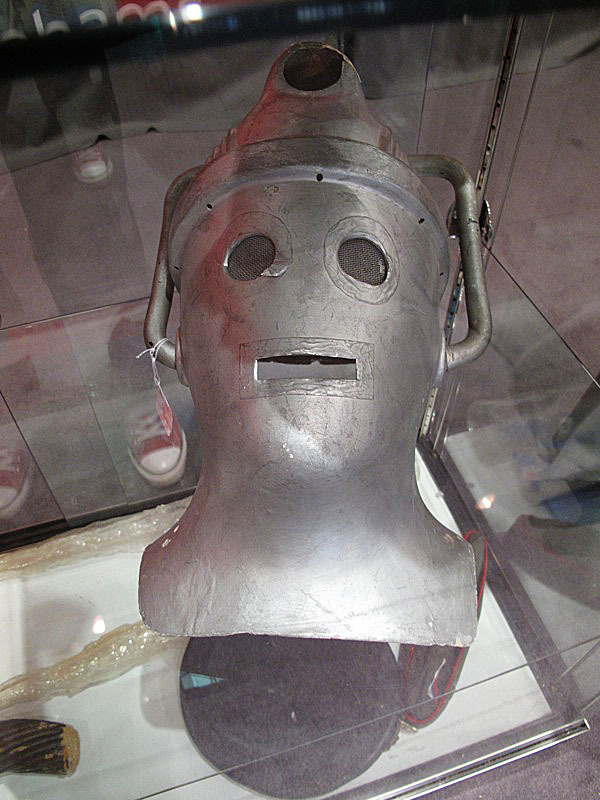 Then we had what the auctioneer claimed was her favorite item from this part of the sale: a Cyberman helmet from Tomb Of The Cybermen. Once again, the £3,000 to £4,000 estimate was way too low, selling in the end (to the person standing next to me as it happened) for £7,800! 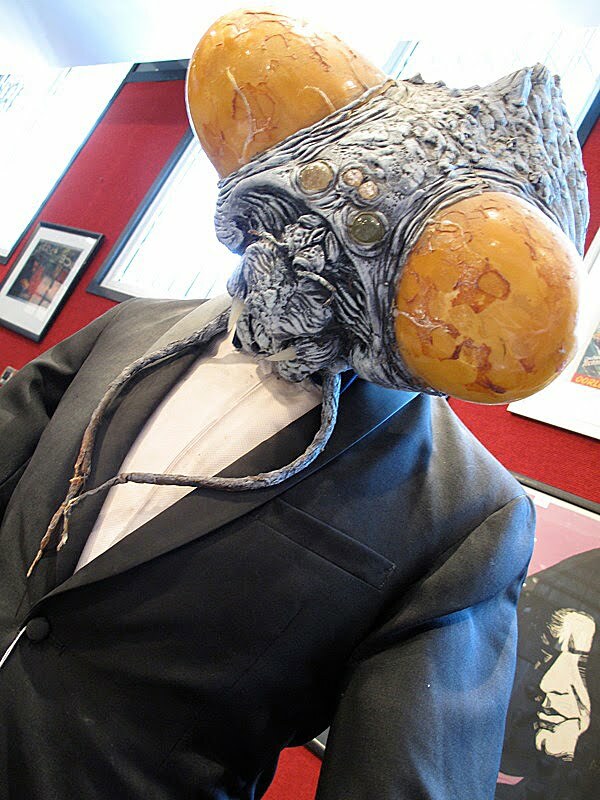 It was now appearing to be the norm for items to sell for way over their estimates, with the next lot, a prop Krynoid prop from The Seeds Of Doom selling for £1,080 instead of £350 to £400 as Bonhams had predicted. The lot was padding in my mind, with the target novel, VHS tape and a book, all with links to the story it came from. Things seemed to calm down with the next lot, a Dalek guard costume worn in 1984 by Rula Lenska in Resurrection Of The Daleks. This sold for bang on the top end of the £800 to £1,200 estimate. The next lot, a Cyberman jump-suit, failed to find a buyer. 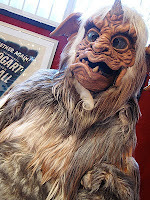 I was wondering if the glut of similar costumes in the last Doctor Who auction in February had a bit to do with it. 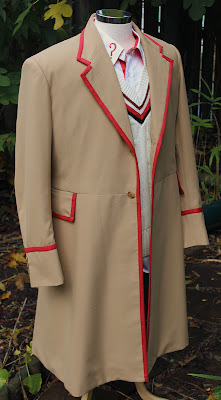 Things were back on track though with the next item, a Zog costume from the Doctor Who - The Ultimate Adventure stage play, so was also the first of the non screen-used items. The estimate had been £200 to £300, but it sold for £660, despite on inspection it looking very cross-eyed!!! There then followed not one, but two K-9’s in rapid succession. The first was the better of the two, and rightly sold for £1,200, considerably more than its £300 to £400 estimate. The second was a much brighter looking model and in places looked unfinished! 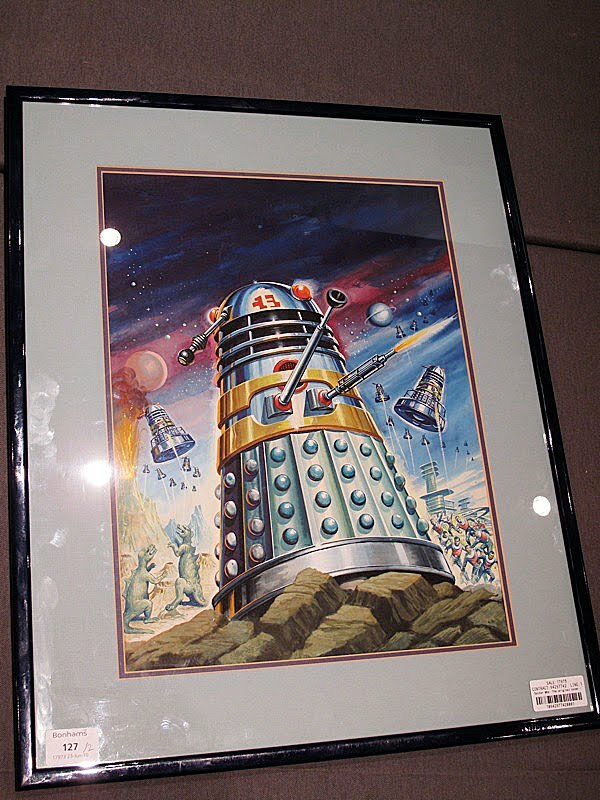 This sold for £504, and had an appropriately lower estimate of £250 to £350. 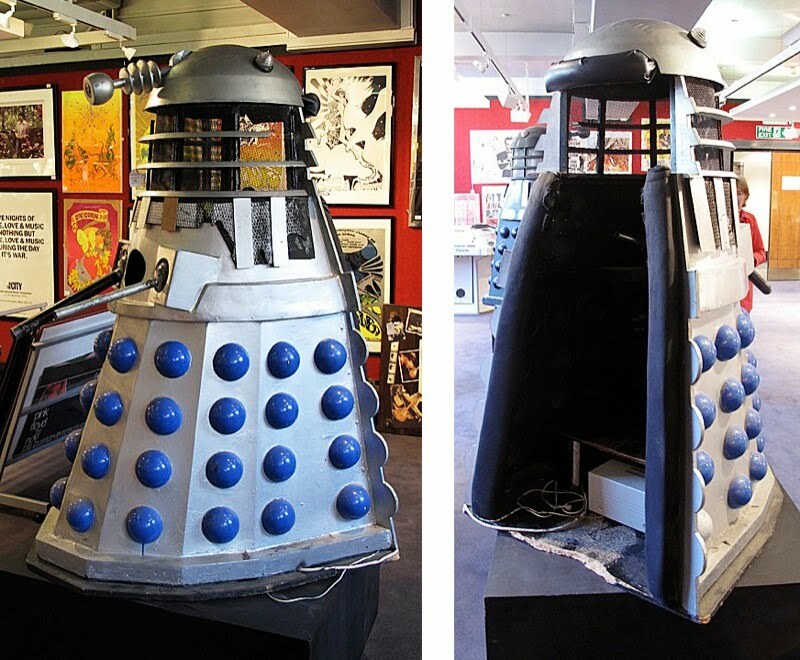 Both of these were ‘Built for exhibition purposes’ as would be basically the rest of the Doctor Who items in this sale. 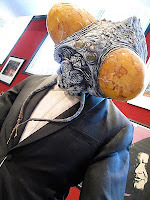 The next lot was a replica Exillion mask. The estimate of £60 to £80 was soon forgotten as it went for £264. The Husk costume, a replica of the one used in Ghost Light, had been cast directly form the screen used costume, but this didn’t put off buyers, when it sold for £540, yet again over its estimate, which was £250 to £350. 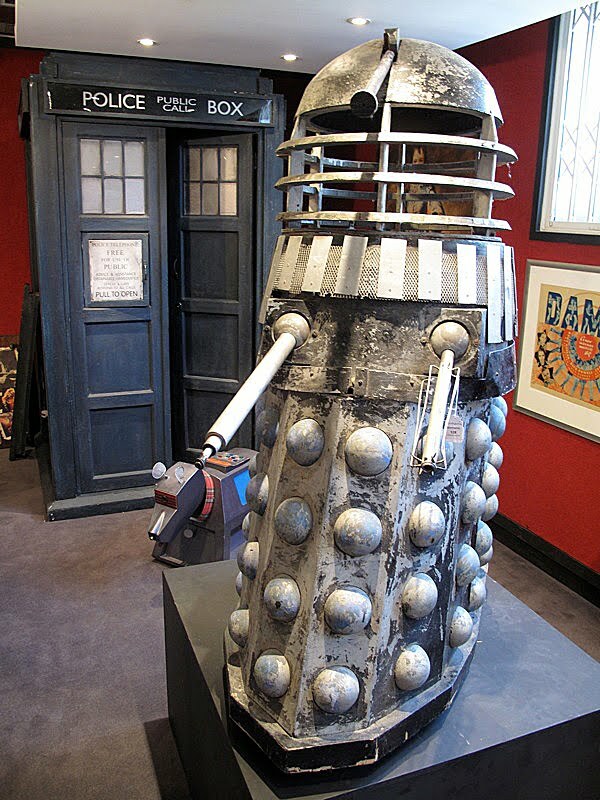 The next item, a miniature TARDIS, had been withdrawn from sale. 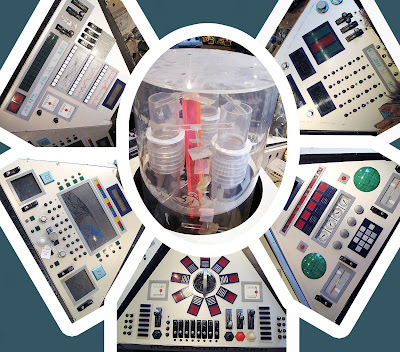 The next item was the ‘Longleat TARDIS Console’. The catalogue had not included any pictures of the console, so it was good to get a chance to photograph it in its entirety. One of the panels was missing, so I just took pictures of the surviving five. It sold for £900, double the top end of its £350 to £450 estimate. This had an estimate of £400 to £600 and sold for a little over that at £720. 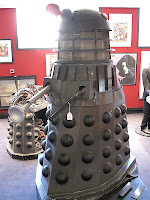 The penultimate lot was the third full-sized Dalek, but as these later items are, one ‘Created for exhibition purposes’. This went for bang in the middle of its £800 to £900 estimate, selling for £900. It was a bit of a mix, as it looked like a 1970s version ala Genesis or Resurrection Of The Daleks. 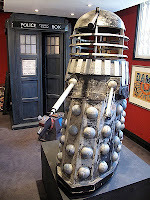 But it had a plunger like that seen in Remembrance Of The Daleks. Very odd. The final, and star item, was a full-sized, screen-used TARDIS from the 2005 series. Bidding was slow on this for some reason – I guess no-one wanted to show their hand too soon! It almost looked like it would go for its opening bid of £8,000, the very bottom of the estimate. But bidding soon picked up and it went for £10,800, right in the middle of the £8,000 to £12,000 estimate. Rumour had it that it had been original purchased form the production by Matt Lucas as a present for his then boyfriend Kevin McGee, prior to their break-up and Kevin’s subsequent suicide. Throughout the early part of the auction, there was a professional cameraman hoovering at the back, with a semi-familiar reporter in tow. Just as the Doctor Who item were finished they packed up and rushed off. As I was leaving, I saw them again outside, interviewing one of the Bonhams staff, and I found it was due to be a report on the ITV lunchtime news that very day (in just over an hour’s time). Here is the report, but it focuses on the sale a some Spitting Image puppets of former Prime Ministers, rather than the Doctor Who items. Finally there was news of the next memorabilia sale, taking place in August in Goodwood near Chichester in Sussex. There will be a viewing at their Bond Street showroom prior to the sale. 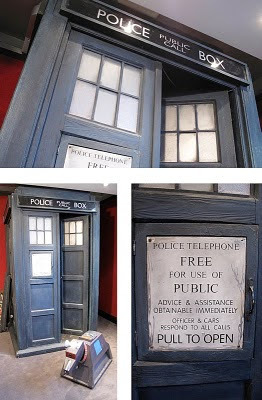 A number of Doctor who items will be included. I wonder what they will be . . .